We chose this cruise as we wanted to get some winter sun which we certainly got. As soon as we got on the ship I felt disappointed, we had previously been on two cruises with Celebrity and the Azura unfortunately did not live up to our expectations. The food in the buffet was absolutely dreadful, I ate a snack there on the first day and returned later in the cruise but other than that I couldn’t eat there. Many passengers were saying the same to me so it isn’t me being fussy. Most days I didn’t eat anything until dinner as the choice was dreadful. On occasions there was an outside barbecue, which again was terrible, I couldn’t eat it. The dinner in the evening was satisfactory but not great, tasteless really. We don’t normally use the specialist restaurants, there was certainly no need on Celebrity Cruises, this time we paid for four different restaurants. The Indian restaurant was superb and we went back again, £20 extra per person. The Glass House was also very nice and very reasonably priced. Afternoon tea was quite nice and free for guests. The entertainment on the ship was OK but repetitive, we saw Jimmy James the first week and again the second week. The cruise entertainment team were good but there should have been more well known entertainers. The bar areas, theatre and halls were nice and good atmosphere. I had never experienced British sail offs, the parties were quite good fun and well worth going to. The islands that we visited in the two week cruise were good, just what we wanted, lots of lovely beaches. 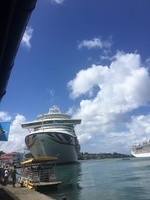 We embarked at Barbados and enjoyed everywhere we went, I can’t recommend P&O, the difference between them and Celebrity Cruises is huge, I can’t see me ever using them again. We chose this cruise as we wanted to get some winter sun which we certainly got. As soon as we got on the ship I felt disappointed, we had previously been on two cruises with Celebrity and the Azura unfortunately did not live up to our expectations. The food in the buffet was absolutely dreadful, I ate a snack there on the first day and returned later in the cruise but other than that I couldn’t eat there. Many passengers were saying the same to me so it isn’t me being fussy. Most days I didn’t eat anything until dinner as the choice was dreadful. On occasions there was an outside barbecue, which again was terrible, I couldn’t eat it. The dinner in the evening was satisfactory but not great, tasteless really. We don’t normally use the specialist restaurants, there was certainly no need on Celebrity Cruises, this time we paid for four different restaurants. The Indian restaurant was superb and we went back again, £20 extra per person. The Glass House was also very nice and very reasonably priced. Afternoon tea was quite nice and free for guests. 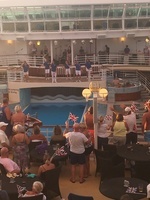 The entertainment on the ship was OK but repetitive, we saw Jimmy James the first week and again the second week. The cruise entertainment team were good but there should have been more well known entertainers. The bar areas, theatre and halls were nice and good atmosphere. I had never experienced British sail offs, the parties were quite good fun and well worth going to. I can’t recommend P&O, the difference between them and Celebrity Cruises is huge, I can’t see me ever using them again. Our room and balcony were spacious as we were given a disabled room not that we had requested one. The room was slightly tired but overall satisfactory and the room service was good. Plenty of storage space, didn’t like the bathroom, quite dated. The balcony was large but wasn’t cleaned the whole two weeks. Beautiful beach, lovely bar in the sea, worth a short boat ride out. We have been to Barbados before, it is one of my favourite Caribbean islands as the people are so friendly. Managed to get to see the cricket which was an added bonus. Lovely beach, quite full but nice.